We provide a FREE Halifax bridging loan calculator that is designed to be easy and simple to use. You can use our Halifax bridging loan to help you find the loan that is right for you. In addition to producing an estimation as to how much you can borrow, our Halifax bridging loan calculator can help you narrow down the bridging loan deals that are suitable for your own personal circumstances. What a Halifax bridging loan can do for you? Get there first – a Halifax bridging loan can help you beat the competition and secure a property before you have even sold your own home, and before another buyer snaps it up. Speed up the process – Gain quick, short-term cash injection to assist you in the transition of purchasing your new home and selling your existing home. Purchase a property at auction – a Halifax bridging loan can provide you with the capital required to secure a property on the day of the auction. Development Finance – If you are planning on purchasing property for redevelopment purposes, a Halifax bridging loan can provide finance to help get the project off the ground. Mortgage Chain Issues – A bridging loan can assist in securing your ability to purchase a property, even in the event that the sale of your old house falls through. Our bridging loan calculator can give you an indication of what kind of loans you might be able to receive. However, it is important to take into consideration that this is only an indication and does not represent advice, or a guarantee that you will be offered a bridging loan on the conditions shown from the selected lenders. Additionally, when calculating your bridging loan repayments using our Halifax bridging loan rates calculator, you should also factor in other costs such as arrangement fees, legal fees, surveys and valuations. 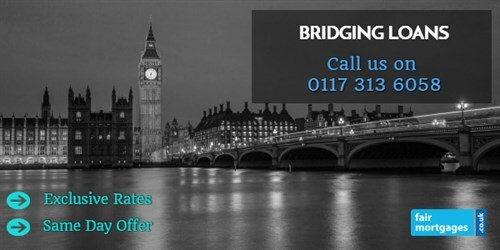 Call us for a FREE initial conversation on 0117 313 6058 about your Halifax bridging loan options or request a callback.